Yesterday Eli Saslow at the Washington Post wrote a fantastic article about Christopher Blair, a man from Maine who has been trolling conservatives and Trump supporters online for years and occasionally even made a living out of it. Blair's main website and Facebook page are named "America's Last Line of Defense" and he uses them to publish various articles and memes that are clearly labeled as satire but which get believed and shared anyway by many people who don't actually read the article or who only got to see a copied version on some other site with the disclaimers and labels missing. The story also profiles one of his "victims" in Nevada, an 72-year-old woman named Shirley Chapian who liked and shared some of Blair's satirical memes and posts along with a steady stream of anti-immigrant, anti-islamic and conservative talking points from other sources. Saslow's story has been one of the most widely read articles so far about Christopher Blair and what he does. Here at Lead Stories we've been following Blair's career from up close and we've written extensively about him and his hoaxes. We've also read much of what others have written about him in order to keep up with his sites and hoaxes. Blair launches two new parody websites targeting Snopes.com and DeadState.org. It appears the feud between Snopes and self-described internet troll Christopher Blair keeps on going: earlier this week he took to Facebook to announce a new parody website that explicitly takes aim at fact checking website Snopes by using a similar color and logo and which also mimics their article format. Media from Denmark, Iceland and France all publish articles and videos featuring John Prager, Blair's second-in-command. John Prager ruller dagens første cigaret og klør sig i skægstubbene, inden han går i gang med dagens første løgnehistorie. Han sidder i halvmørket, bag nedrullede persienner og kigger ind i sine to computerskærme. På den ene henter han inspiration ved at læse kommentarer, som læserne skriver på ét af højrefløjens mest populistiske medier, Breitbart. John Prager vefur sér fyrstu sígarettu dagsins og gerir sig kláran til að semja fyrstu lygafrétt dagsins. Hann hefur tekjur sínar af hægri öfgasíðum sem hann heldur úti. Danska ríkisútvarpið DR ræðir við Prager. Prager situr í hálfrökkvuðu herbergi og horfir á tvo tölvuskjái. France 2 France Télévisions À 36 ans, John Prager est l'un des plus actifs fabricants de fausses nouvelles des États-Unis. Sa dernière publication : l'aînée des Obama a été arrêtée en possession de drogue. Un texte comme un vrai article, une photo truquée et le tour est joué. Longread exploring Blair's methods and history, including his early work (the "goat herd"). Includes more bits of the conversation I had with Blair for a BBC radio podcast. The stories were, in the main, pitched to Donald Trump supporters. They included rumours about Hillary Clinton's health problems and illegal dealings, stories about luminaries like Pope Francis lining up behind the Republican candidate, and other false news sure to either please or rile Trump's supporters. November 17 at 7:40 PM The only light in the house came from the glow of three computer monitors, and Christopher Blair, 46, sat down at a keyboard and started to type. His wife had left for work and his children were on their way to school, but waiting online was his other community, an unreality where nothing was exactly as it seemed. Recently the BBC World Service's "Trending" programme did a two part story about Christopher Blair, the liberal troll and internet hoaxer well known to anybody who has been following Lead Stories' reporting on him. Readers of this site are probably aware that some of the content found on Macedonian fake news websites is often copied directly from the satirical sites and Facebook pages of Christopher Blair and his friends. A story about protesters vandalizing Brett Kavanaugh's house to the tune of $11,000 in damages went viral about four days ago and was first debunked by Lead Stories. It looks like a Snopes fact check. It reads like a Snopes fact check. And on first glance, it looks like one of the outlandish fake news stories that ends up getting debunked. But the article - titled "FACT-CHECK: Did Kim Jong Un Really Invite Donald Trump To His Birthday party?" NORTH WATERBORO (NEWS CENTER Maine) - An explosion at Al Franken's house kills six people. A child is expelled from school for wearing a Donald Trump costume. Nancy Pelosi's daughter is arrested for drug trafficking. None of this is true, but it's shocking, and each is probably a headline you've seen in your Facebook feed. Kurt Withrow, a former insurance salesman from Palatine, Illinois, didn't mean to become one of the thousands of people who helped propel forward one of the most persistent fake news stories of the last year. But in January, a story making its way around Facebook caught his eye. STORY UPDATED: check for updates below. Regular readers of Lead Stories know we've been following the exploits of Christopher Blair for quite some time now. WATERBORO, Maine - Christopher Blair was sitting quietly in the corner of Dunkin' Donuts, not far from his home on an unpaved road in rural Maine, looking at his phone. People around him, absorbed in their own phones, paid no attention to the large man sitting alone among them. Over the past couple of weeks, Facebook leaders including CEO Mark Zuckerberg have been repeating the talking point that the platform has found and deleted foreign accounts that pushed fake news about the December Alabama Senate special election. Zuckerberg even suggested that the accounts were deleted before they impacted "discussion around the election." STORY UPDATED: check for updates below. For regular readers of Lead Stories Christopher Blair needs no more introduction. They can skip the next paragraph. Others are kindly invited to keep reading. A man vocal about his aims to deceive conservatives with his "satire" websites has created multiple made-up stories alleging voter fraud in the Alabama Senate special election. Some of these made-up stories have gone viral and were subsequently copied by fake news websites in an attempt to delegitimize the election and fuel right-wing myths about widespread voter fraud. STORY UPDATED: check for updates below. Prolific prankster and internet troll Christopher Blair just launched another website to poke fun at unsuspecting conservatives who tend to think his stories are real and who often like, share and comment them into going viral. Earlier this week we reported that fake/satire site "Freedum Junkshun" had been put on a blacklist by Facebook so it became impossible to share links to it on the social network. This followed the earlier ban on The Resistance: The Last Line of Defense, another site from the same network that simply switched domain names and has been back in business ever since. Visitors to Freedum Junkshun, one of Chris Blair's (in)famous satirical fake news sites, reportedly can no longer share links from the site on Facebook. We tested it ourselves and were greeted by this message: It is quite strange how a page that doesn't even exist and which returns a 404 error can be considered spam: http://freedumjunkshun.com/thislinkdoesnotexist. 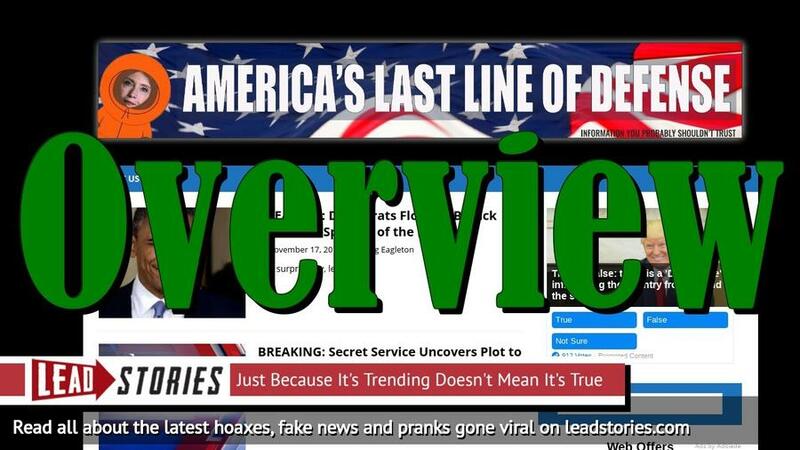 Fake/satire website The Resistance: The Last Line Of Defense has announced they are online again in an article titled: "Infamous 'Fake News' Site Resurrected By Russian Trolls". Recently Facebook blocked users from posting links to the site forcing it to adopt a new domain name (nunadisbereel.com). There aren't many apologies given after fake news is posted. Yet, two days after a so-called "satire" site posted a false story smearing the "black soldier" who was killed during a 4 October 2017 ambush in Niger as a "deserter," administrators for the Facebook page that promoted the story apologized and took it down. One of Blair's sites published (and retracted) a hoax claiming an American soldier who died in action was actually a deserter, using his real name and picture. STORY UPDATED: check for updates below. Infamous fake/satire website Freedum Junkshun posted an article titled "BREAKING: Black Soldier Killed In Niger Was A Deserter" which opened: Sergeant La David T.
Hoax Alert Recently we criticized an article by fake/satire website Freedum Junkshun titled "BREAKING: Black Soldier Killed In Niger Was A Deserter" for using the real name and real image of a soldier who died in Niger (Sergeant La David T. Johnson) and accusing him of being a deserter without the slightest shred of evidence. STORY UPDATED: check for updates below. Facebook has blocked the sharing of links from the infamous satirical fake news website " The Resistance: The Last Line Of Defense" as of a few hours ago. STORY UPDATED: check for updates below. Notorious self-described "liberal troll" Christopher Blair recently caught a lot of flak for inventing a fake story about a mosque and hurricane Harvey aid but that hasn't deterred one of his sites from publishing a new hoax article titled "Georgia Mosque KEEPS Hurricane Harvey Donations, Will Send To Syrian Refugees Instead". The Last Line Of Defense made up all the names in the article, which got over 2,000 likes, shares, and comments on Facebook, according to social tracking tool BuzzSumo. The site is run by Christopher Lyman, also known as Busta Troll, who told BuzzFeed News a writer for the site found the image. The fake satire website The Resistance: The Last Line of Defense publised a hoax article titled "BREAKING: Texas Mosque Refuses To Help Refugees: 'Allah Forbids Helping Infidels'". UPDATE: A second fake article has been added, titled: " Hurricane Victims Storm And Occupy Texas Mosque Who Refused To Help Christians". In a delicious twist of irony a famous satirical fake news website manages to take down or seriously hamper dozens of "real" fake news sites using nothing but copyright law. If you've seen a fake news story on the Internet, there's a good chance it came from the mind of a 45-year-old Maine man who umpires Little League games. Barack Obama arrested for wiretapping Donald Trump! Clinton Foundation ship caught smuggling refugees! Trey Gowdy's son found dead in a D.C.
Buzzfeed writes about Blair, his websites and the Macedonian fake news sites copying his articles without attribution. Initially Blair is misidentified as "Christopher Lyman". A correction dated March 10, 2017 notes his real name is "Christopher Blair" and adds a note about the difference between a guinea pig and a hamster. However an archived copy at archive.org shows only the "hamster" note was added on March 10, 2017, an archived copy from March 14, 2018 still shows the uncorrected "Lyman" name being used throughout the article. It looks like the name correction was mistakenly added to the earlier correction notice instead of being added to a new one with its own date. On Mar. 4, a website run by an American who identifies himself as "Busta Troll" published a completely false story claiming the FBI had a warrant for Barack Obama's arrest for illegally wiretapping Donald Trump. Blair's site America's Last Line of Defense makes its first appearance in this BuzzFeed article investigating a viral fake news story. In it Blair identified himself as "Zeke Wilekenmeyer" to the reporters. : Added BBC article "The Godfather of Fake News"
: Added stories from Media Matters, the Hudson Reporter and one more from Lead Stories (on the midterm moratorium).